When asked to come up with a gift idea for a friend’s newly renovated kitchen, a quote by the French gastronome, Jean Anthelme Brillat-Savarin, immediately came to mind: Tell me what you eat and I will tell you who you are. 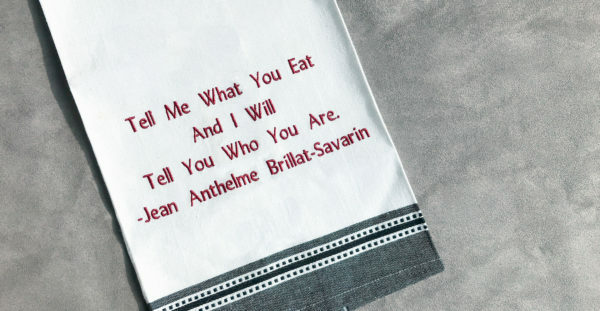 I know the saying in its original French version (Dis-moi ce que tu manges, je te dirai ce que tu es. ), French being my mother tongue. It was the quote printed on the opening page of the first cookbook I ever bought, and while the original quote was published in 1825, it still rings true to me today. Now Let’s Make Some Embroidery! Start with a New design file. 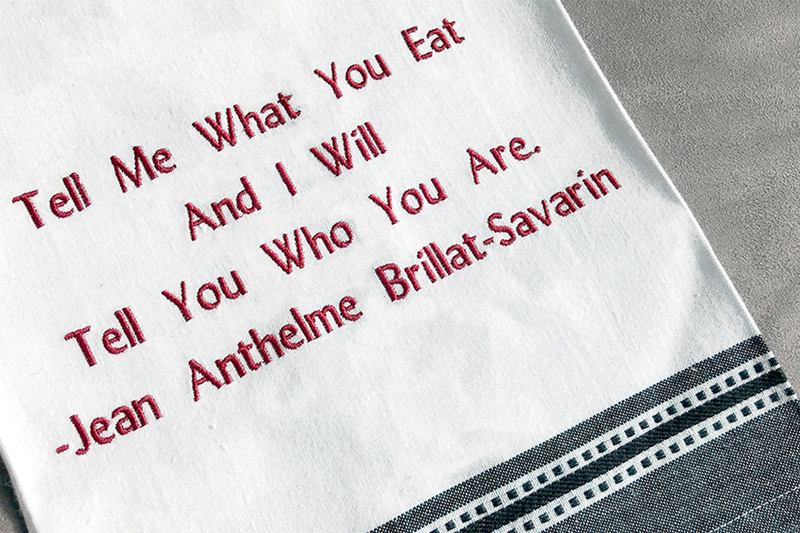 Type the file name: Kitchen Towel Saying. Select the Lettering Tool and use a Straight baseline as the Lettering Shape. 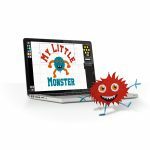 In the Choose Alphabet section, click on the Lydian Alphabet. 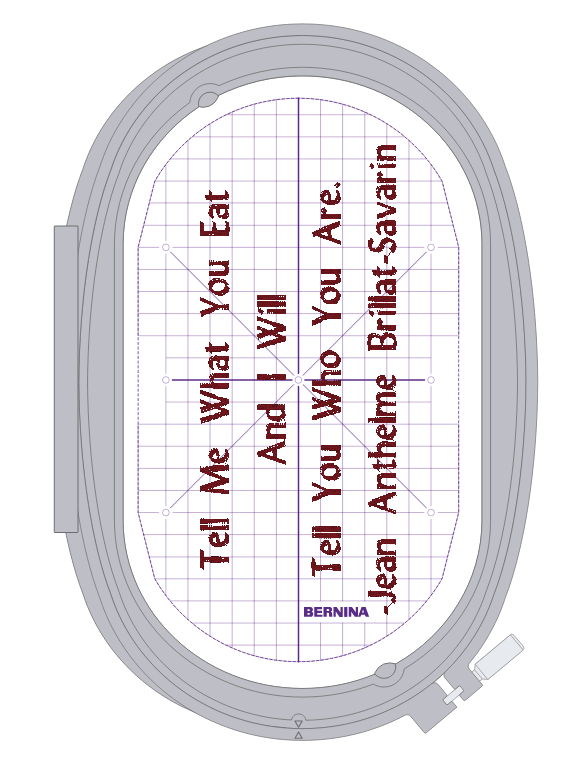 In the Enter Text section, type the text: Tell Me What You Eat. Press Enter. In the Character Style Section, make sure the letter height is set to 0.5 inch (13 mm). NOTE: This first line will be centered on the grid. Any additional lines of text you create will be generated in the same location, so they will pile up on the first. We will drag lines 2, 3, and 4 down as we create them so they form the saying needed. TIP: Now that you have used these settings for one line of lettering, Toolbox will remember them for your next lines. 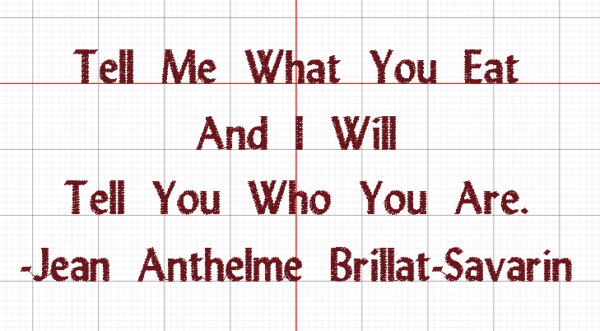 Swipe across any lettering in the Enter Text box and Type in the second line of text: And I Will. Drag the second line down to place it under the first. 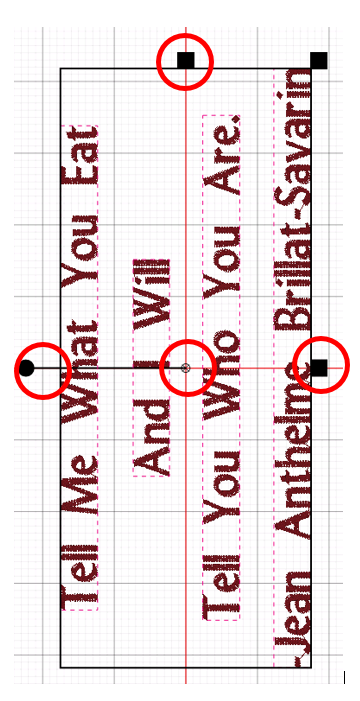 I used a 1 inch grid and placed each line so that its baseline would be on the next inch line down (the 1/2 inch letters are in a 1 inch space). Continue adding the phrase until all 4 lines are created and placed. Note: When you drag a line of text down, it may not land perfectly centered from left to right. Never sweat the small stuff! We will now align all the lines perfectly. Select the Edit Tool and in the Alignment section, click on the Align Centers Vertical. Note: The design isn’t centered on the grid at this point. We will take care of this later. Since the saying will be embroidered near the bottom (hem) of the towel, we will rotate it to the left. This way the towel can be hooped where the hem is to the right and inside the harp of the machine. The bulk of the towel can hang over the embroidery module arm to the left. This makes the embroidery process much easier as the towel won’t get in its own way. The saying is now on its side, but not necessarily centered on the grid. Now it’s time for a hoop fitting! I like to preview my hoop in Toolbox software so that I never get a surprise at the machine. So we know we will need to use the Large Oval Hoop. We’re done! All that’s left to do is Export the machine file. Pro TIP: Do you have a Midi Hoop for your BERNINA embroidery machine yet? If you own a new 5 Series, 7 Series, or the B 880 PLUS embroidery machine, the Midi Hoop is a great optional hoop. The Midi hoop cuts down on your prep time by a lot. The ergonomic twist-lock mechanism greatly speeds up the prep before stitching and after! So you can keep rolling with your embroidery. People who love to eat are always the best people. If you’re afraid of butter, use cream. Gourmands enjoy the best of both worlds. When life gives you lemons, make lemon meringue pie.